Opdivo's marketing campaigns need to both market to and educate consumers about the new immuno-therapy cancer treatment. Campaign: Opdivo and "Ready. Raise. Rise." Commercials for cancer treatments are a new phenomenon. With more pharmaceutical companies focusing on immuno-oncology - treatments that activate the patient’s immune system to fight cancer cells - research and development, the cancer drug market is getting crowded. One such drug is Bristol-Myers Squibb’s Opdivo. As a new treatment, it faces several hurdles including educating patients about what exactly it does and when to use it, along with encouraging them to talk to their doctors and choose the treatment. "While chemotherapy, surgery, and radiation represented the mainstays of lung cancer therapy for decades, immunotherapies have only been introduced in the last few years and required a new way to educate patients," says Teresa Bitetti, SVP of U.S. oncology at Bristol-Myers Squibb. The drug faces another education and marketing hurdle as it gains approval to treat several different forms of cancer. 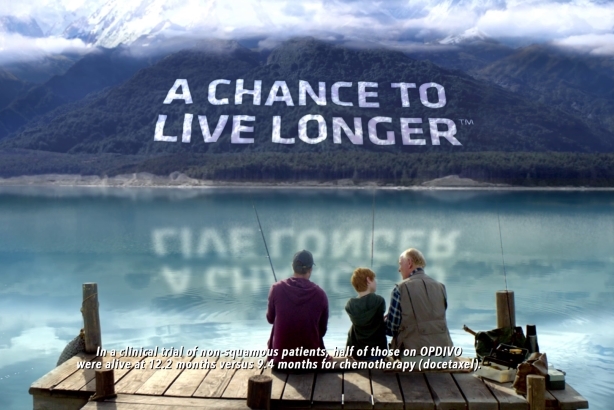 One advertising campaign for Opdivo is running on TV spots and in print, focused on the treatment of non-small cell lung cancer. "Many patients are reluctant to seek treatment or lose hope and decline additional treatment after progressing on their previous therapy," Bitetti says. "There is a lack of awareness and understanding of additional treatment options beyond chemotherapy. We understand patients are eager to learn more about the options available, and our approach to DTC [direct to consumer] is one example of how we meet that need." The ad campaign needs to be both marketing and educational because the treatment is so new. The ads emphasize that immunotherapy is different to chemotherapy. One ad notes that 40,000 patients have been treated with Opdivo to show viewers that, even though it’s a new treatment, it is already widely used. "The commercial is intended to inform patients and their loved ones that there are other options beyond chemotherapy," Bitetti continues. "And that Opdivo is an approved immunotherapy that has demonstrated improved survival rates for some patients with previously treated advanced non-small cell lung cancer." Bristol-Myers Squibb is concurrently running an unbranded campaign called Ready. Raise. Rise. and has a separate dedicated immunotherapy website to educate patients about how it works for various forms of cancer. Ready. Raise. Rise. partnered with Modern Family actor Eric Stonestreet who shares his personal story of cancer impacting his family and appears in videos explaining how immunotherapy works. The campaign asks people to raise virtual flags in honor of their loved one with cancer. For each virtual flag raised, Bristol-Myers Squibb donates money to more than 20 advocacy organizations. "[Ready. Raise. Rise.] provides a platform for people to participate in the fight against cancer by learning about immuno-oncology, celebrating and honoring loved ones touched by the disease, and supporting the cancer community," Bitetti says.